Be amongst the first to experience our newly renovated La Quinta Inn & Suites San Antonio Northwest. New dcor throughout the hotel and guestrooms will completely enhance your guest experience. As a dynamic and geographical gateway to the southwest, San Antonio's distinctive beauty, heritage, culture, art and people attract 26 million people a year making it one of the most visited cities in Texas. The La Quinta Inn & Suites San Antonio Northwest is conveniently located just 5 miles from both Six Flags Fiesta Texas & SeaWorld! Discount tickets are available to all of our guests. 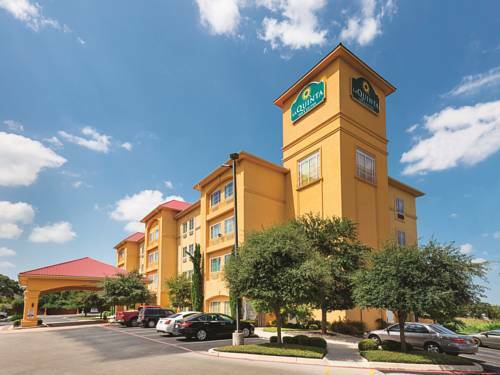 Here at La Quinta Inn & Suites San Antonio Northwest, you will enjoy a welcoming atmosphere and friendly staff. Your spacious rooms are full of amenities like free high-speed Internet access, microwave, refrigerator, hair dryer, iron & ironing board, and flat screen 32-inch TVs, just to name a few. Start your day with our Free Bright Side Breakfast, that includes hot items like "Make-Your-Own Waffles", eggs, sausage, and biscuits & gravy served each morning near the lobby. Make use of our meeting facilities, full business center with free high speed Internet access, fitness center, and a relaxing outdoor pool and heated spa; we even have dry cleaning service! ~43 miles from San Antonio.